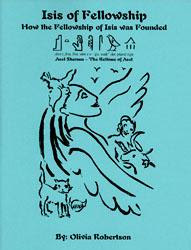 The booklet, "Isis of Fellowship, How the Fellowship of Isis was Founded" has been newly reprinted. For this version, Olivia Robertson added a chapter for the Muses Symposium that she created from her past writings about this FOI special project. Her artwork, The Peacock Goddess, has also been added. Former chapters include: "Foundation, the Throne of Isis", "Return of the Priestess", "College of Isis Revived", "Spirals of Light", "Dana's Land of Immortality", "Ladies & Knights of the Green Earth", "The Goddess Has New Helpers", and "Isis Prophetis." 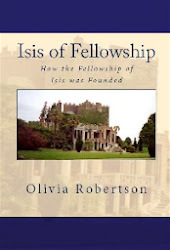 If you have previously purchased "Isis of Fellowship", and would like an insert of the new chapter to print out, please contact us. 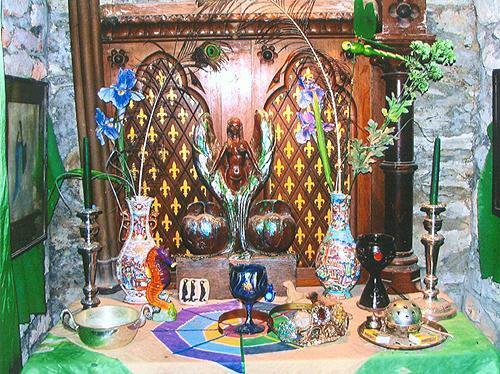 The above photo is of the Shrine of Sagittarius, which is located in the Chapel of Brigid of Clonegal Castle. 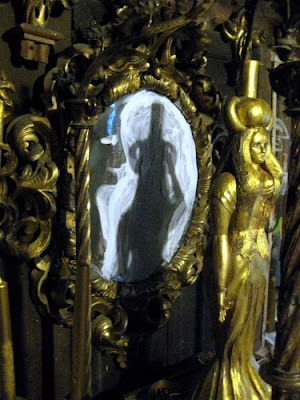 Over the altar, you can see Olivia Robertson's artwork of "Bride Ad Infinitum". 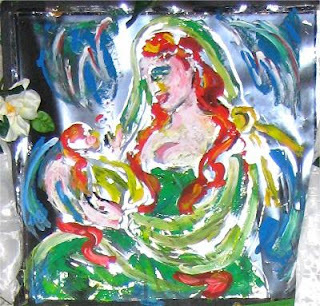 "I have painted a 5-fold Palladium myself for our Temple of Isis, super-imposing it over a silver Piscean Madonna. She has vermillion red hair, very long, and she holds her baby girl, also with long red hair. The baby holds a doll with spiky red hair; the doll holds a mini-doll - and all are held within great hands of Brigid, from the sky. She is Brigid holding Bride, Magdalene holding Sophia. . . something was lacking. Were we only to diminish in consciousness? No! So I painted those giant hands coming out of a tumultuous sky enfolding the figure in an eternal embrace, because I believe the Goddess exists. We're not the only creatures in the Universe." Photo courtesy of Minette Quick. no theological dissension nor philosophical contradictions. for the stars are many-hued and bring differing gifts. Yet all spring from one source, the Cosmic Mother." 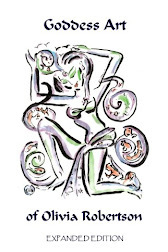 From: "Sophia, Cosmic Consciousness of the Goddess" by Olivia Robertson. 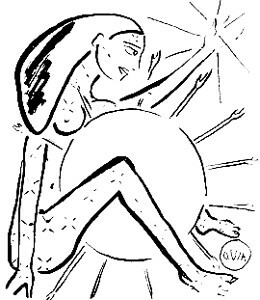 Artwork: "Isis, Mother of the Sun" by Olivia Robertson. 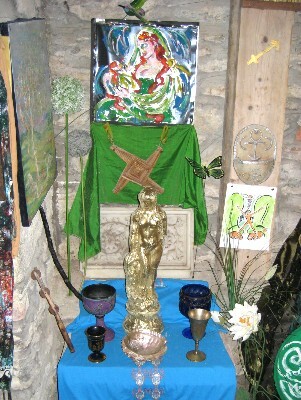 This is the Shrine of Scorpio in the Well Chapel at the Castle Foundation Center. Look closely, and you'll see the Cosmic Web of the Universe of the Fellowship of Isis on the altar cloth.